In June of 2016 Instagram reached 500 million users. A month later, they launched Instagram stories. And now, Instagram is one of the most influential and engaged social media channels. You can easily share your daily stories with your friends, family and fans. If you want to have detailed insights of your Instagram profile, we highly recommend you download StatiGRAM. It is a beautifully designed and easy-to-use analytics and report tool for your Instragram profile. 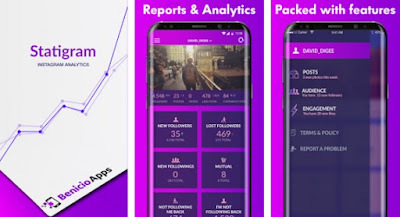 Packed with cool features and tools, this app is all about detailed Instagram profile statistics. Created for both Android phones and tablets, StatiGRAM is free of ads and it’s completely free for download. The StatiGRAM app features over 30 awesome analytical tools that provide with accurate data and behavioral statistics about your Instagram account. With this instagram statistics tool you can find out which users are your secret admirers, which ones haven’t followed you back, which posts of yours are most engaged, etc. The app has tons of other features, such as new followers, lost followers, users not following you back, most engaged photo and video of the week, ghost followers, least given and most given photos, users you have unfollowed, earliest followers, and many more to come. Keep in touch with your Instagram profile’s life by downloading StatiGRAM for free from Google Play and don’t forget to share it with your friends.